I wandered by this waymark while we were in New Orleans. This historic place is located at 701 St. Louis Street, New Orleans, in the Parish of Orleans, Louisiana. The GPS coordinates for this location are N 29° 57.378 W 090° 03.974. 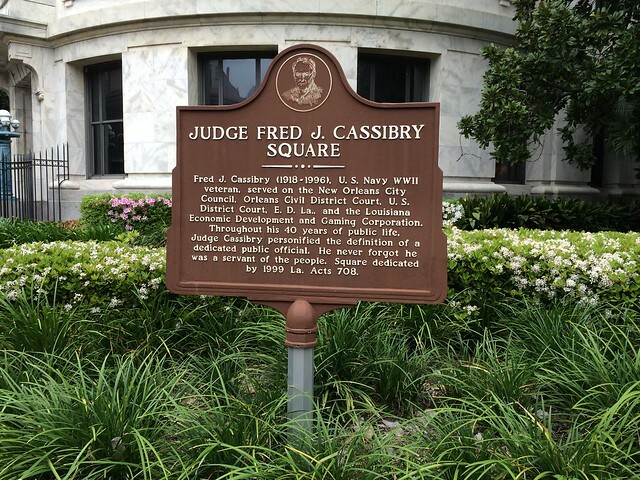 Fred J. Cassibry (1918-1996), U.S. Navy WWII veteran, served on the New Orleans City Council, Orleans Civil District Court, U.S. District Court, E.D. La., and the Louisiana Economic Development and Gaming Corporation. Throughout his 40 years of public life, Judge Cassibry personified the definition of a dedicated public official. He never forgot he was a servant of the people. Square dedicated by 1999 La. Acts 708.